30 men and women put their best faces forward in hopes of winning a professional modeling contract at the Fresh Faces 2015 Thailand Finals in Pattaya. Representatives from world-class modeling agencies from Italy, Taiwan, and China served as judges at the Dec. 7 contest at the Zign Hotel. Samantha Masuk won the top female prize and 50,000 baht, along with a 120,000-baht prize package. Nutchanok Cheuikedkam placed second, winning 55,000 baht in cash and prizes while Thanatchaporn Sarannarongsatid placed third and took home the same amount in prizes and cash. The winner of the men’s competition was Rath Rojana who won 175,000 baht in cash and prizes. Jiraroj Siwasaksaran placed second and Kim Phillip Bhuman was third. 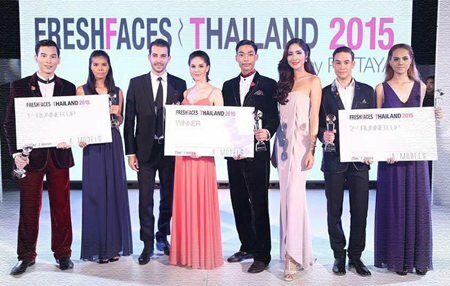 Samantha Masuk and Rath Rojana (centre) pose with the 1st and 2nd runners-up during the Fresh Faces Thailand 2015 Finals held at the Zign Hotel in Pattaya on Dec. 7. The male and female winners go on to complete in the Fresh Faces finals in Barcelona, Spain next year. There they will compete against 39 other countries and strut the catwalk during Barcelona Fashion Week. Chayanon Wonghiranratch and Bhuman won the 50,000 baht Fresh Skin Model by Dr. Tony Clinic award; while the popular vote prize went to Phuwisa Chawang, who took home a Samsung smartphone. Launched in 2010, the contest was the world’s first to combine online voting, social media promotion and live events with a major modeling network.